Density and phase 0.6813 g/L, gas. Solubility in water 89.9 g/100 ml at 0 °C. Main hazards Toxic and corrosive. Ammonia is a chemical compound of nitrogen and hydrogen, with the formula NH3. It is a gas at standard temperature and pressure, has a characteristic pungent odor, and is corrosive to some materials. Liquid ammonia is a strong ionizing solvent that can dissolve alkali metals to form colored, electrically conducting solutions. In living systems, ammonia plays several important roles, serving as a source of nitrogen for plants and helping maintain acid/base balance in animals. It is produced during the normal metabolism of amino acids and is converted to urea in the liver. Liver dysfunction may lead to toxic levels of ammonia in the blood. Ammonia is one of the most extensively manufactured inorganic chemicals, used mainly for the production of fertilizers, explosives, and polymers. It is also the active ingredient in household glass cleaners. Substances containing ammonia or those similar to it are called ammoniacal. Ammonia occurs in small quantities in the atmosphere, being produced from the putrefaction of nitrogenous animal and vegetable matter. This chemical and its salts (ammonium salts) are also present in small quantities in rainwater; ammonium chloride (called sal ammoniac) and ammonium sulfate are found in volcanic districts; and crystals of ammonium bicarbonate have been found in Patagonian guano. The kidneys excrete ammonium ions (NH4+) to neutralize excess acid. Ammonium salts are also distributed in fertile soil and seawater. Salts of ammonia have been known from very early times. Thus the term Hammoniacus sal appears in the writings of Pliny the Elder, although it is not known whether that term is identical with the more modern sal ammoniac. As early as the thirteenth century, ammonia was known to the alchemists in the form of sal ammoniac, which was mentioned by Albertus Magnus. It was also used by dyers in the Middle Ages in the form of fermented urine to alter the color of vegetable dyes. In the fifteenth century, Basilius Valentinus (Basil Valentine) showed that ammonia could be produced by the action of alkalis on sal ammoniac. At a later period, when sal ammoniac was obtained by distilling the hoofs and horns of oxen and neutralizing the resulting carbonate with hydrochloric acid (HCl), the name "spirit of hartshorn" was applied to ammonia. Gaseous ammonia was first isolated in 1774 by Joseph Priestley, who called it alkaline air. Eleven years later, in 1785, Claude Louis Berthollet ascertained its composition. In 1909, Fritz Haber and Carl Bosch developed a method of producing ammonia from atmospheric nitrogen. This method, called the Haber process or the Haber-Bosch process, was first used on an industrial scale by the Germans during World War I, following the Allied blockade that cut off the supply of nitrates from Chile. The ammonia was used to produce explosives to sustain their war effort. Dozens of chemical plants produce ammonia around the world. In 2004, the global ammonia production was 109 million metric tons. The output from the People's Republic of China was 28.4 percent of the worldwide level, followed by India with 8.6 percent, Russia with 8.4 percent, and the United States with 8.2 percent. About 80 percent or more of the ammonia produced is used for fertilizing agricultural crops. Before the start of World War I, most ammonia was obtained by the dry distillation of nitrogenous vegetable and animal waste products, including camel dung. It was distilled by the reduction of nitrous acid and nitrites with hydrogen. Additionally, it was produced by the distillation of coal; and by the decomposition of ammonium salts by alkaline hydroxides such as quicklime (CaO). The salt most often used was ammonium chloride (NH4Cl), and the reaction can be written as follows. Today, the typical modern ammonia-producing plant first converts natural gas (that is, methane) or liquified petroleum gas (mainly propane and butane) or petroleum naphtha into gaseous hydrogen. Starting with a natural gas feedstock, hydrogen is produced as follows. The steam reforming, shift conversion, carbon dioxide removal and methanation steps each operate at absolute pressures of about 25 to 35 bar, and the ammonia synthesis loop operates at absolute pressures ranging from 60 to 180 bar, depending on the proprietary design used. In certain organisms, ammonia is produced from atmospheric nitrogen (N2) by enzymes called nitrogenases. The overall process is called nitrogen fixation. Intense efforts have been directed toward understanding the mechanism of biological nitrogen fixation. The scientific interest in this problem is motivated by the unusual structure of the active site of the enzyme, which consists of an Fe7MoS9 ensemble. Ammonia is a colorless gas with a characteristic pungent smell. It is lighter than air, its density being 0.589 times that of air. It is easily liquefied; the liquid boils at -33.3 °C and solidifies at -77.7 °C to a mass of white crystals. An ammonia molecule has the shape of a trigonal pyramid. This shape makes the molecule polar, so that ammonia readily dissolves in water. The nitrogen atom in the molecule has a lone electron pair, and ammonia acts as a base. It means that, when in aqueous solution, it can take a proton from water to produce a hydroxide anion (OH−) and an ammonium cation (NH4+), which has the shape of a regular tetrahedron. The degree to which ammonia forms the ammonium ion depends predominantly on the pH of the solution—at "physiological" pH (around 7), about 99 percent of the ammonia molecules are protonated. Temperature and salinity are additional factors in the proportion of NH4+. The maximum concentration of ammonia in water (a saturated solution) has a density of 0.880 g /cm³ and is often known as '.880 Ammonia'. All the ammonia contained in an aqueous solution of the gas may be expelled by boiling. Liquid ammonia possesses strong ionizing powers (ε = 22), and solutions of salts in liquid ammonia have been extensively studied. Liquid ammonia has a very high standard enthalpy change of vaporization (23.35 kJ/mol). It can therefore be used in laboratories in non-insulated vessels at room temperature, even though it is well above its boiling point. Ammonia does not sustain combustion, and it does not burn readily unless mixed with oxygen, when it burns with a pale yellowish-green flame. At high temperature and in the presence of a suitable catalyst, ammonia is decomposed into its constituent elements. Chlorine catches fire when passed into ammonia, forming nitrogen and hydrochloric acid; unless the ammonia is present in excess, the highly explosive nitrogen trichloride (NCl3) is also formed. The ammonia molecule readily undergoes nitrogen inversion at room temperature—that is, the nitrogen atom passes through the plane of symmetry of the three hydrogen atoms. A useful analogy is an umbrella turning itself inside out in a strong wind. The energy barrier to this inversion is 24.7 kJ/mol in ammonia, and the resonance frequency is 23.79 GHz, corresponding to microwave radiation of a wavelength of 1.260 cm. The absorption at this frequency was the first microwave spectrum to be observed. In commercial usage, ammonia can be in the anhydrous form (that is, not dissolved in water) or an aqueous solution (that is, dissolved in water) referred to as ammonium hydroxide. Anhydrous ammonia must be stored under pressure or at low temperature to maintain it as a liquid. The strength of ammonium hydroxide is measured in units of baume (density), with 26 degrees baume (about 30 percent ammonia by weight, at 15.5 °C) being the typical high-concentration commercial product. Household ammonia ranges in concentration from 5 to 10 percent ammonia by weight. 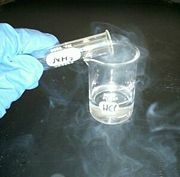 Hydrochloric acid (in the beaker) releases HCl fumes that react with ammonia fumes (from the test tube) to produce a white smoke of ammonium chloride. One of the most characteristic properties of ammonia is its power of combining directly with acids to form salts. Thus, with hydrochloric acid it forms ammonium chloride (sal ammoniac); with nitric acid, ammonium nitrate; and so forth. Perfectly dry ammonia, however, will not combine with perfectly dry hydrogen chloride (a gas), as moisture is necessary to bring about the reaction. This is a Brønsted-Lowry acid-base reaction in which ammonia acts as an acid. In reactions with organic compounds, ammonia can act as a nucleophile in substitution reactions. For example, it reacts with alkyl halides to form amines. Methylamine is prepared commercially by the reaction of ammonia with chloromethane, and the reaction of ammonia with 2-bromopropanoic acid has been used to prepare alanine in 70 percent yield. Ethanolamine is prepared by a ring-opening reaction with ethylene oxide: the reaction is sometimes allowed to go further to produce diethanolamine and triethanolamine. Amides can be prepared by the reaction of ammonia with a number of carboxylic acid derivatives. Acyl chlorides are the most reactive, but the ammonia must be present in at least a twofold excess to neutralize the hydrogen chloride formed. Esters and anhydrides also react with ammonia to form amides. Ammonium salts of carboxylic acids can be dehydrated to amides so long as there are no thermally sensitive groups present: temperatures of 150–200 °C are required. The hydrogen in ammonia is capable of replacement by metals. Thus, magnesium burns in the gas with the formation of magnesium nitride (Mg3N2), and when the gas is passed over heated sodium or potassium, sodamide (NaNH2) and potassamide (KNH2) are formed, respectively. Where necessary in substitutive nomenclature, IUPAC recommendations prefer the name azane to ammonia: hence chloramine would be named chloroazane in substitutive nomenclature, not chloroammonia. A ball-and-stick model of the diamminesilver(I) cation, [Ag(NH3)2]+. The ball in the middle represents the silver atom. Tetraamminecopper(II), [Cu(NH3)4]2+, a characteristic dark blue complex formed by adding ammonia to solutions of copper(II) salts. Diamminesilver(I), [Ag(NH3)2]+, the active species in Tollens' reagent. Formation of this complex can also help distinguish between precipitates of the different silver halides: AgCl is soluble in dilute (2 Molar) ammonia solution, AgBr is only soluble in concentrated ammonia solution while AgI is insoluble in aqueous solution of ammonia. Ammine complexes of chromium(III) were known in the late nineteenth century, and formed the basis of Alfred Werner's theory of coordination compounds. Werner noted that only two isomers (fac- and mer-) of the complex [CrCl3(NH3)3] could be formed, and concluded that the ligands must be arranged around the metal ion at the vertices of an octahedron. This has since been confirmed by X-ray crystallography. Liquid ammonia is the best-known and most widely studied nonaqueous ionizing solvent. Its most conspicuous property is its ability to dissolve alkali metals to form highly colored, electrically conducting solutions containing solvated electrons. Apart from these remarkable solutions, much of the chemistry in liquid ammonia can be classified by analogy with related reactions in aqueous solutions. Comparison of the physical properties of NH3 with those of water shows that NH3 has the lower melting point, boiling point, density, viscosity, dielectric constant and electrical conductivity. These properties are due at least in part to the weaker hydrogen bonding in NH3 and the fact that such bonding cannot form cross-linked networks in the way water molecules do. Given that liquid ammonia is an ionizing solvent, it can dissolve a range of ionic compounds, including many nitrates, nitrites, cyanides, and thiocyanates. Most ammonium salts are soluble, and these salts act as acids in liquid ammonia solutions. The solubility of halide salts increases from fluoride to iodide. The solubilities of some salts are given below. Liquid ammonia will dissolve alkali metals and other electropositive metals such as calcium, strontium, barium, europium, and ytterbium. At low concentrations (<0.06 mol/L), deep blue solutions are formed. These contain metal cations and solvated electrons, free electrons that are surrounded by a cage of ammonia molecules. Ammonia solution is also used as universal indicator that could be used to test for different gases that require a universal indicator solution to show the gases were present. In addition to serving as a fertilizer ingredient, ammonia can also be used directly as a fertilizer by forming a solution with irrigation water, without additional chemical processing. The latter use allows for the continuous growing of nitrogen-dependent crops such as maize (corn) without crop rotation, but this type of use leads to poor soil health. This use of ammonia suffers from several disadvantages. It is a toxic gas, an irritant, and corrosive to copper alloys. Also, over a kilogram is needed for even a miniature fridge. With an ammonia refrigerant, the ever-present risk of an escape brings with it a risk to life. However data on ammonia escapes has shown this to be an extremely small risk in practice, and there is consequently no control on the use of ammonia refrigeration in densely populated areas and buildings in almost all jurisdictions in the world. Its use in domestic refrigeration has been mostly replaced by CFCs and HFCs in the First World, which are more or less non-toxic and non-flammable, and butane and propane in the Third World, which despite their high flammability do not seem to have produced any significant level of accidents. Ammonia has continued to be used for miniature and multifuel fridges, such as in minibars and caravans. These ammonia absorption cycle domestic refrigerators do not use compression and expansion cycles, but are driven by temperature differences. However the energy efficiency of such refrigerators is relatively low. Today, the smallest refrigerators mostly use solid state peltier thermopile heat pumps rather than the ammonia absorption cycle. Ammonia continues to be used as a refrigerant in large industrial processes such as bulk icemaking and industrial food processing. As haloalkanes are thought to be major contributors to ozone depletion in the upper atmosphere, ammonia is again seeing increasing use as a refrigerant. Occasionally, ammonia is added to drinking water along with chlorine to form chloramine, a disinfectant. Unlike chlorine on its own, chloramine does not combine with organic (carbon-containing) materials to form carcinogenic halomethanes such as chloroform. Liquid ammonia was used as the fuel of the rocket airplane, the X-15. Although not as powerful as other fuels, it left no soot in the reusable rocket engine, and has about the same density as the oxidizer, liquid oxygen, which simplified the aircraft's keeping the same center of gravity in flight. During the 1960s, tobacco companies such as Brown & Williamson and Philip Morris began using ammonia in cigarettes. The addition of ammonia enhances the delivery of nicotine into the bloodstream. As a result, nicotine’s reinforcement effect was enhanced, increasing its addictive ability without increasing the proportion of nicotine. Ammonia is an important source of nitrogen for living systems. Although atmospheric nitrogen abounds, few living creatures are capable of utilizing this nitrogen. Nitrogen is required for the synthesis of amino acids, which are the building blocks of protein. Some plants rely on ammonia and other nitrogenous wastes incorporated into the soil by decaying matter. Others, such as nitrogen-fixing legumes, benefit from symbiotic relationships with rhizobia that create ammonia from atmospheric nitrogen. Ammonia also plays a role in both normal and abnormal animal physiology. It is created through normal amino acid metabolism but is toxic at high concentrations. The liver converts ammonia to urea through a series of reactions known as the urea cycle. Liver dysfunction, such as that seen in cirrhosis, may lead to elevated amounts of ammonia in the blood (hyperammonemia). Likewise, defects in enzymes (such as ornithine transcarbamylase) responsible for the urea cycle lead to hyperammonemia. This condition contributes to the confusion and coma of hepatic encephalopathy, as well as the neurologic disease common in people with urea cycle defects and organic acidurias. Ammonia is important for normal animal acid/base balance. Ammonium is excreted in the urine, resulting in net acid loss. Ammonia may itself diffuse across the renal tubules, combine with a hydrogen ion, and thus allow for further acid excretion. Ammonia was first detected in interstellar space in 1968, based on microwave emissions from the direction of the galactic core. This was the first polyatomic molecule to be so detected. The sensitivity of the molecule to a broad range of excitations and the ease with which it can be observed in a number of regions has made ammonia one of the most important molecules for studies of molecular clouds. The relative intensity of the ammonia lines can be used to measure the temperature of the emitting medium. The detection of triply-deuterated ammonia was considered a surprise, as deuterium is relatively scarce. It is thought that the low-temperature conditions allow this molecule to survive and accumulate. The ammonia molecule has also been detected in the atmospheres of the gas giant planets, including Jupiter, along with other gases like methane, hydrogen, and helium. The interior of Saturn may include frozen crystals of ammonia. The toxicity of ammonia solutions does not usually cause problems for humans and other mammals, as a specific mechanism exists to prevent its build-up in the bloodstream. Ammonia is converted to carbamoyl phosphate by the enzyme carbamoyl phosphate synthase, and then enters the urea cycle to be either incorporated into amino acids or excreted in the urine. However fish and amphibians lack this mechanism, as they can usually eliminate ammonia from their bodies by direct excretion. Even at dilute concentrations of ammonia are highly toxic for aquatic animals, and for this reason it is classified as dangerous for the environment. Ammonium compounds should never be allowed to come in contact with bases (unless an intended and contained reaction), as dangerous quantities of ammonia gas could be released. Solutions of ammonia (5–10 percent by weight) are used as household cleaners, particularly for glass. These solutions are irritating to the eyes and mucous membranes (respiratory and digestive tracts), and to a lesser extent the skin. They should never be mixed with chlorine-containing products or strong oxidants, for example household bleach, as a variety of toxic and carcinogenic compounds are formed (such as chloramine, hydrazine, and chlorine gas). The hazards of ammonia solutions depend on the concentration: "dilute" ammonia solutions are usually 5–10 percent by weight (<5.62 mol/L); "concentrated" solutions are usually prepared at >25 percent by weight. A 25 percent (by weight) solution has a density of 0.907 g/cm³, and a solution which has a lower density will be more concentrated. The European Union classification of ammonia solutions is given in the table. S-Phrases: S1/2, S16, S36/37/39, S45, S61. The ammonia vapor from concentrated ammonia solutions is severely irritating to the eyes and the respiratory tract, and these solutions should only be handled in a fume hood. Saturated ("0.880") solutions can develop a significant pressure inside a closed bottle in warm weather, and the bottle should be opened with care: this is not usually a problem for 25% ("0.900") solutions. Anhydrous ammonia is classified as toxic (T) and dangerous for the environment (N). The gas is flammable (autoignition temperature: 651 °C) and can form explosive mixtures with air (16–25%). The permissible exposure limit (PEL) in the United States is 50 ppm (35 mg/m3), while the IDLH concentration is estimated at 300 ppm. Repeated exposure to ammonia lowers the sensitivity to the smell of the gas: normally the odor is detectable at concentrations of less than 0.5 ppm, but desensitized individuals may not detect it even at concentrations of 100 ppm. Anhydrous ammonia corrodes copper- and zinc-containing alloys, and so brass fittings should not be used for handling the gas. Liquid ammonia can also attack rubber and certain plastics. ↑ MSDS Sheet. from W.D. Service Co. Retrieved January 9, 2008. ↑ In this case, "standard temperature and pressure" refers to a temperature of 25 °C and a pressure of 100 kilopascals. ↑ B. Kirschbaum, D. Sica, and F.P. Anderson electrolytes and the urine anion and osmolar gaps.. Retrieved January 12, 2008. ↑ Lyndy Abraham. Marvell and alchemy. (Aldershot Scolar, 1990). ↑ The "standard enthalpy change of vaporization," less correctly known as the "heat of vaporization," is the energy required to transform a given quantity of a substance into a gas. ↑ By comparison, the standard enthalpy change of vaporization for water is 40.65 kJ/mol; for methane is 8.19 kJ/mol; for phosphine is 14.6 kJ/mol. ↑ LaRoche Ammonium hydroxide physical properties. ↑ H. B. Baker, (1894). J. Chem. Soc. 65: 612. ↑ Each NH3 molecule has only 1 lone-pair of electrons, compared with 2 for each H2O molecule. The ionic self-dissociation constant of liquid NH3 at −50 °C is approximately 10-33 mol2•l-2. ↑ Dichlorodifluoromethane by Aaron Vorderstrasse, Western Oregon University. ↑ Alix M. Freedman, "'Impact Booster': Tobacco Firm Shows How Ammonia Spurs Delivery of Nicotine," The Wall Street Journal, Dec. 28, 1995. ↑ M.B. Adjei, K.H. Quesenberry and C.G. Chamblis. Nitrogen Fixation and Inoculation of Forage Legumes University of Florida IFAS Extension. June 2002. ↑ Johannes Zschocke and Georg Hoffman. Vademecum Metabolism. (Friedrichsdorf, Germany: Milupa GmbH, 2004). ↑ Burton Rose and Helmut Rennke. Renal Pathophysiology. (Baltimore, Maryland: Williams & Wilkins, 1994). ↑ A.C. Cheung, D.M. Rank, C.H. Townes, D.D. Thornton, and W.J. Welch, 1968, "Detection of NH3 molecules in the interstellar medium by their microwave emission," Phys. Rev. Lett. 21, 1701. ↑ P. T. P. Ho and C.H. Townes, 1983, "Interstellar ammonia, Ann. Rev. Astron. Astrophys. 21: 239-270. ↑ T. J. Millar, "Deuterium Fractionation in Interstellar Clouds," Space Science Reviews 106 (1): 73-86. ↑ Kirk Munsell. (ed.) Image page credit Lunar and Planetary Institute. NASA. NASA's Solar Exploration: Multimedia: Gallery: Gas Giant Interiors. URL accessed April 26, 2006. Bretherick, L., ed. 1986. Hazards in the Chemical Laboratory, 4th ed. London: Royal Society of Chemistry. ISBN 0851864899. Brown, Theodore E., H. Eugene LeMay, and Bruce E. Bursten. 2005. Chemistry: The Central Science, 10th ed. Upper Saddle River, NJ: Prentice Hall. ISBN 0131096869. Housecroft, Catherine E., and Alan G. Sharpe. 2001. Inorganic Chemistry, 4th ed. Harlow, UK: Prentice Hall. ISBN 0582310806. McMurry, John, and Robert C. Fay. 2004. Chemistry, 4th ed. Upper Saddle River, NJ: Prentice Hall. ISBN 0131402080. Moore, John W., Conrad L. Stanitski, and Peter C. Jurs. 2002. Chemistry: The Molecular Science. New York: Harcourt College. ISBN 0030320119. Smith, Roland. 1994. Conquering chemistry. Sydney: McGraw-Hill. ISBN 0074701460. This page was last modified on 15 March 2016, at 16:00.